EPA Sends Man to Prison for Protecting Town from Flooding | What Did You Say? President Trump’s administration is moving forward to implement an executive order that revokes the Obama policy on waters of the United States. The EPA and the Army Corps of Engineers are proposing a rule to rescind the Clean Water Rule regulation established by President Obama. The Obama-era policy gives the federal government authority over a staggering 60% of the water bodies in the United States, including small streams, private ponds, intermittent streams, and even “wetlands” on private property created by seasonal rain. Note: I wrote this column in 2008 when I served as the director of the Idaho Values Alliance. I worked with Sen. Mike Crapo’s office to get a pardon request into President Bush’s hands before he left office in January, 2009, but unfortunately the pardon request was not acted upon. When Mr. Moses began to develop a subdivision along Teton Creek in 1980, Teton County required him to implement an engineer’s plan to modify the Teton Creek stream bed to prevent the flooding of subdivision property, caused by the buildup of gravel bars and downed trees, during high water flows in the spring. In fact, the county would not allow him even to record the plat for the subdivision until the modification work had been done, and only allowed the development after requiring the homeowner’s association to maintain the flood control channel year after year. So working on plans developed by an engineer and approved — in fact, required — by the county, Mr. Moses got to work and cleared the channel of gravel bars and downed cottonwood trees to ensure that the channel would serve as a flood control structure. For years he has walked the entire length of the creek to evaluate conditions and then remove gravel bars, sand, logs and debris as necessary to keep the channel clear and satisfy the subdivision’s obligation to the county. 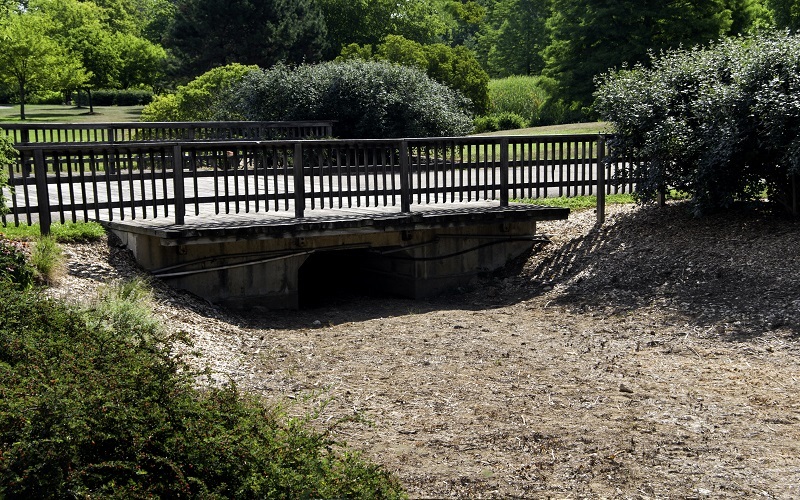 When Driggs flooded in the spring of 1981 — due to a clogged culvert under a county road — the county approached the Corps a second time, asking for funding and help to replace the culvert with a bridge to prevent future flooding. Once again, the Corps said, Nope, not our problem, not our fault, not our responsibility to fix, we don’t have jurisdiction. He did his work when the stream bed was dry, of course, and never put anything into the stream bed, only took “pollutants” (sedimentation, sand, gravel, etc.) out. Tellingly, in 1984, when the Forest Service needed to build a road, they came to this same stretch of Teton Creek and — without any kind of permit — contracted with Mr. Moses to excavate between 5,000 and 6,000 cubic yards of gravel from the bed, all of which was inspected by government officials. Every four or five years, when new staff would replace the old, and a generation would arise “who knew not Joseph,” Mr. Moses would receive a letter from the Corps of Engineers, insisting that he needed to get a permit from them for his maintenance work. He’d write them back, informing him that, according to the Corps itself, they had no jurisdiction over intermittent streams. That would be that. He’d hear nothing for another four to five years, after which another staff rotation led to another letter from the Corps and to a similar reply from Mr. Moses. And so it went for over 20 years. Before the jury was dismissed to enter into deliberations at the conclusion of his trial, Judge Lynn Winmill instructed the jury, believe it or not, to disregard every bit of information from 1980 to 2002, including the Corps’ denial of jurisdiction and the mandate from local government for Mr. Moses to maintain the flood channel. His conviction ignores the fact that no evidence was ever presented in court that Mr. Moses “discharged” anything into the stream bed at all. He only removed sand and gravel bars that were already there and which he was contractually obligated to remove. He was extracting material from the channel, not discharging material into it. No evidence was presented in court by the EPA that there was any water at all in the stream bed during those years for Mr. Moses to “discharge” anything into. The EPA claims that “fallback” — material from the bank falling back into the stream bed — represents a “discharge,” but it offers no objective criteria for deciding how much “fallback” it takes to cross the magic threshold, meaning the EPA used sheer speculation to assert a violation. Worse, Mr. Moses was convicted of “pollut(ing) a spawning area for Yellowstone cutthroat trout,” despite the fact that there have been no fish in this stream bed for more than 150 years. Mr. Gagner, who has lived near the flood channel for 18 years, says he has never seen fish in this stream bed. And it’s not even possible for the stream bed to serve as a spawning ground since it only has water two months out of every year in the first place. Although the director of the EPA in Idaho, Jim Wernitz, asserts that Mr. Moses had damaged “wetlands” associated with the stream, there are no wetlands there! The very word requires that land be, well, wet, but the stream bed is bone dry for at least 10 months out of every year. Wernitz is apparently ignorant of the fact that the Government had previously stipulated that there are no wetlands surrounding the storm channel, nor any “aquatic environment” that could be damaged. Mr. Moses’ wife died unexpectedly of a heart attack a year and a half ago. Friends tell me the stress of their 25-year battle with the federal government and the stress of the guilty verdict contributed to her early death. Mr. Moses, when I spoke with him this morning, agrees that this is a likely possibility. The death of his wife has left Mr. Moses to raise his 17-year-old daughter by himself, a daughter who will have to fend for herself once her sole surviving parent is tossed behind bars — in another state no less — for the next 18 months. His daughter, just now entering her senior year in high school, will be deprived of his comfort and counsel right when she needs it the most. Mr. Moses will miss his daughter’s companionship, and miss the joy of her 18th birthday party, her senior prom and her graduation ceremony. Virtually everything is wrong with this story. It’s an egregious violation of the constitutional limitations on federal power, as federal bureaucrats simply dismissed the fact that Mr. Moses was required by local authorities to do exactly what he was doing. His attorney calls the whole thing “a travesty,” which is just about the mildest thing that can be said about this unconscionable miscarriage of justice. As George Washington is reputed to have said, “Government is not reason; it is not eloquent; it is force. Like fire, it is a dangerous servant and a fearful master.” Lynn Moses will tell you that the government’s fire cannot just singe you but burn you to a crisp.